5 – Pounds of Organic Red Potatoes – Boiled with 1 head of garlic cloves and then mashed. (Taro Root, Name’ Root or Cinnamon Vine Root could also be used) Salt and Pepper the potatoes to your taste. Take a 17 inch cast iron skillet or another heavy skillet and spray the bottom with a little organic oil of your choice. Next take a layer of garlic mashed potatoes and place that on the bottom of the skillet… spreading it out evenly. Next spoon on a nice layer of organic hummus. Then add on top washed organic spinach leaves and then chopped tomatoes. Next add a smaller layer of mashed potatoes and then pour on the organic marinara sauce. Place in a preheated 425 degree oven for 1 hour or until nice and brown. Let cool and slice and you have a wonderful casserole that’s sure to please everyone. Garlic contains allicin which in double blind studies has been shown to cut your probability of coming down with a cold or flu by 50%. But allicin must be taken in it’s natural form as fresh garlic.Garlic has been shown to lower blood pressure and manage blood pressure for long periods of time. Garlic has the ability to help you use iron more effectively, so if you are low in iron and taking an iron supplement also take Garlic. Garlic can help prevent the accumulation of fats in the liver. Garlic increases bile flow from the gallbladder thus it helps to prevent gallstones and congestion of the liver. Garlic has been shown to heal away plaques in arteries… and thus help to improve cardiovascular disease, stokes, and other diseases. Garlic has lots of research showing that it can lower bad cholesterol (LDL Cholesterol) and triglycerides. Also helps to increase good cholesterol (HDL Cholesterol) and thus helps to prevent heart attacks and stokes. Garlic has lots of B Vitamins, A and C Vitamins and zinc to boost your immune system and lots of other trace minerals such as iron and copper for anemia, selenium for prostate health, calcium and phosphorus for strong bones, and tryptophan for helping you to get a good nights rest. Garlic is a good antibacterial, anti-fungal, and anti-viral agent making it great for preventing and curing all kinds of disease processes. One of the best all around preventatives for disease on the planet. And Garlic Tea is great… and it makes a wonderful tea for healing colds and flues. Garlic contains diallyl sulphide, quercetin, nitrosamine, aflatoxin, allin, ajoene, and more great antioxidants that slow the aging process and protect your DNA. 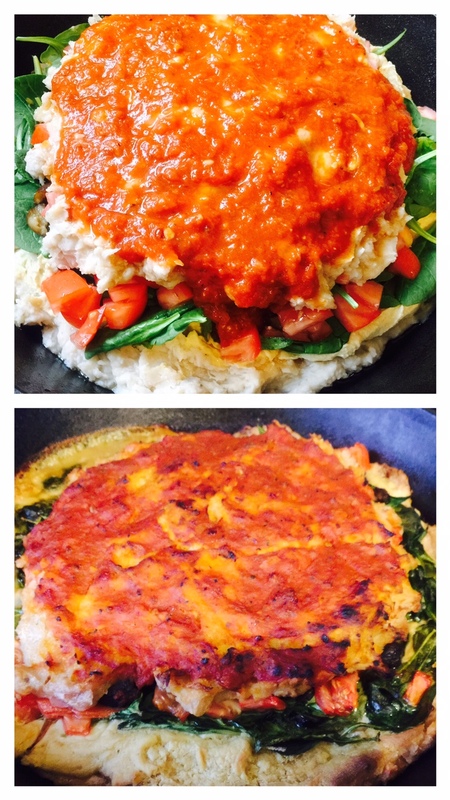 This entry was posted in Healing Herbs and tagged Dr. Paul Haider, easy, Garlic, Gluten free, Good For You, Health and Wellness, Healthy, Heavy Cast Iron Pan, HH, Hummus, Lots of Garlic, Master Herbalist, Organic, Plant Based, Potatoes, Quick, Recipe, Spinach, Sure to Please, Tastes Great, Tomatoes, USA, vegan, Very Healthy, whole foods. Bookmark the permalink. Reblogged this on Cecy V.